As usual, when reading my mechanical advice…keep in mind I make my living in computers…not motorcycles. 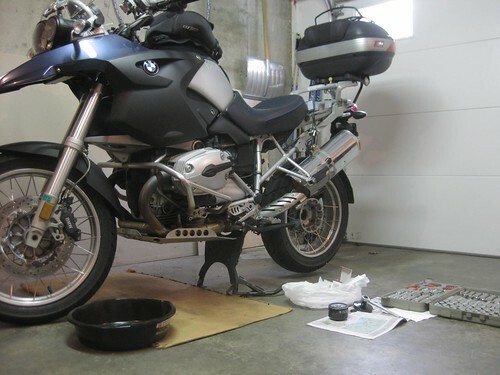 My first oil change on the GS proved to be unexpectedly easy. 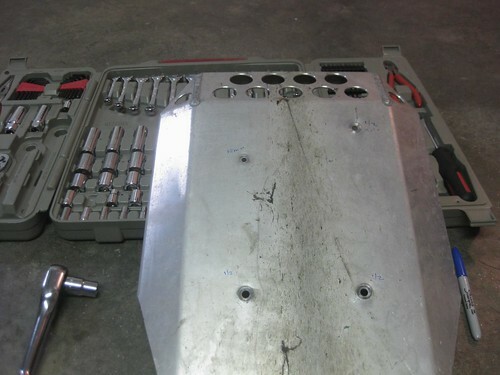 (The bike’s oil had been changed this summer, at the dealer) As compared to BMW K bikes,the parts are easy to access. The only challenge was locating the right size tool to remove the aftermarket skid plate, why would the plate be secured with one 10mm bolt and 3 ½ inch bolts? I marked the plate so that I’d remember how to put it back together. 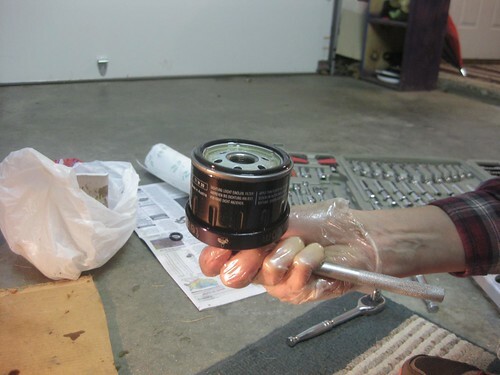 I did need to purchase a new oil filter wrench, no doubt imported from Germany! I ran the bike for about 10 minutes to warm things up. I’ve put on many unexpected miles this November, so I was a little bit overdue for a change. 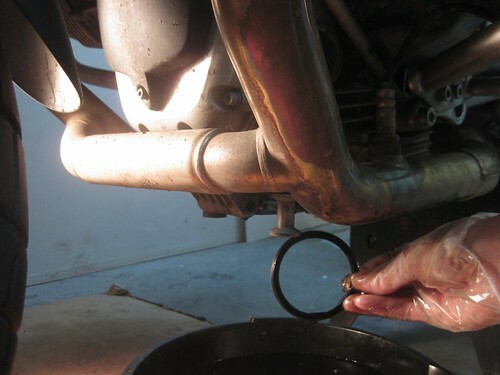 Carefully remove the drain plug, try not to let it plop into the waste oil. 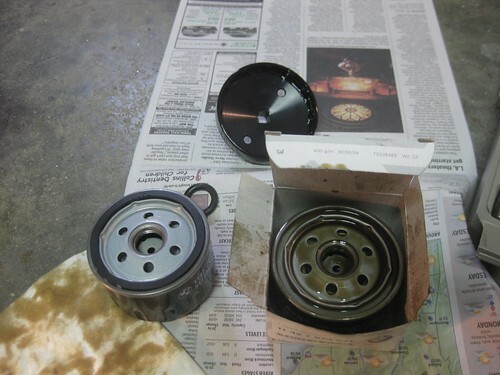 When the majority of the oil is drained, remove the oil filter. Take care to hand loosen it at the end so that you’ll have a good grip on it, and sweep it out of the way when the oil pours out. Examine the old filter. If you look carefully, you’ll see the old filter is missing the ring. This is an important point. You must now retrieve the old ring. Miss this step and you are in big trouble trying to get the new filter to seed. Give the new filter a little drink before installing it. Here is an undershot of the bike, this is where the new filter goes. Try not to get oily gloved hands on the camera! Oil changes are even quicker if you don’t take pictures of each step! Make note of your miles, and update your records. And you’re good to go for another…well you decide…I shoot for every 5,000. That way I’m not changing it 4 times a season. I use synthetic oil as not only is it manufacturer's recommendation but I call it the "lazy man's oil change" because I only have to change it every 5000 miles instead of 3000 with conventional oil. You are so neat and tidy using gloves and a cardboard drip tray, I like it. Sure beats my way of spilling oil all over the floor, kneeling and rolling my shoulders in it, spreading (clean) kitty litter down to mop it up, having kitty litter stick to the oil I wiped on my shirt, grit and oil on my face from scratching an itch on my nose then having to sweep the floor. Thanks for the pics. With the miles you do, a synthetic could prove beneficial. It will allow extended drain periods or maintain it's viscocity better if the drain interval is missed. 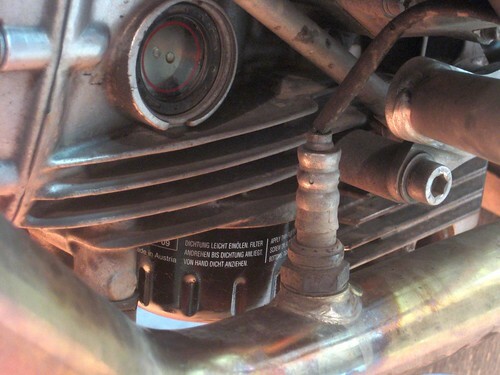 Great shot of the oil filter cavity. I never knew what it looked like - 'cause I'm not sticking my head under the there. 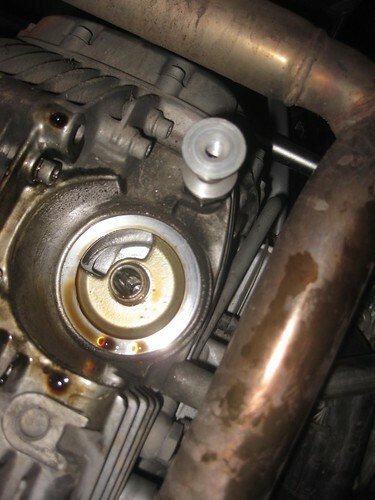 Cool photos ... my KTM has 2 filters, both on top of the cases so when you pop the bolts off to get to the filters you get oil all over the engine. 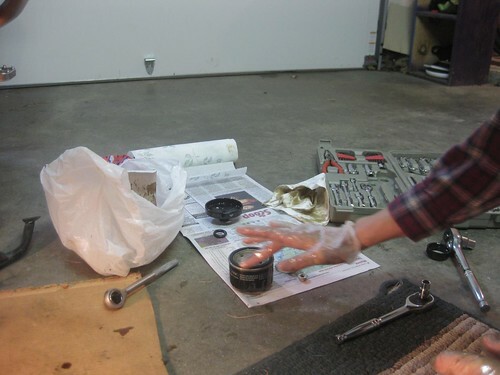 I had not thought of wearing rubber gloves when doing an oil change but I always wear them cleaning and reoiling the air filter. Great job! 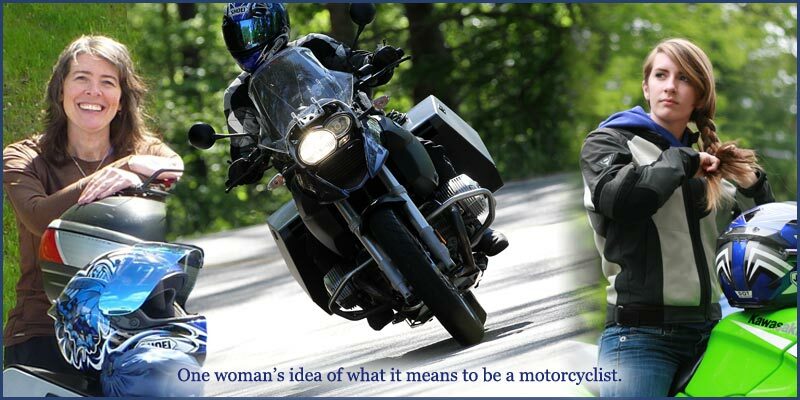 Hi...I'm looking at doing a 2 week M/C trip from Newfoundland to New Hampshire area this June. Once down there, I'd like to spend the bulk of my time hiking in the White Mountains or therabouts. Would a loaded V-Strom 650 be generally safe at the trailheads? Most of my gear will be locked in the pelicans, but I'm just wondering about the bike. I don't carry any extra insurance at all up here (just public liability). Much appreciate your thoughts. And super blog by the way! You can drop me an email if you like (tmhollett@gmail.com). Thanks! the real important reason for getting the old gasket off is if you do somehow get the new filter on there, you will likely find all your oil on the floor instead of inside your engine where it belongs. worse still if it happens 10 minutes down the road. Very detailed photos there. 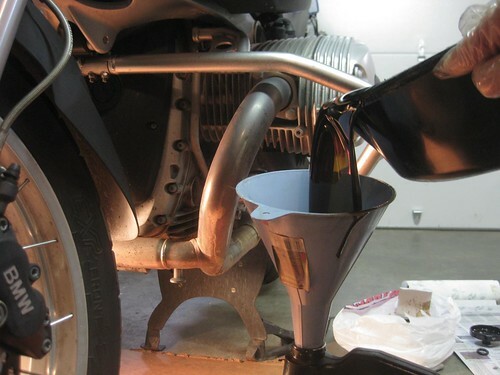 I occasionally use Street Motorcycle oil since i own a street bike. 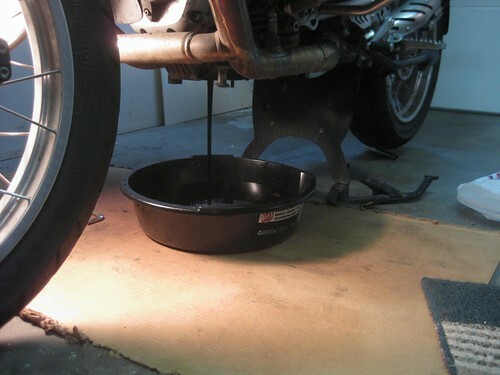 But i must say that changing the oil is one of the things i find unpleasant. I always find someone to do it for me but the next time i will try and do it on my own. Am impressed that you do it so comfortably.